GTT Communications has acquired Access Point, a provider of communication services headquartered in Cary, North Carolina for $40 million. GTT paid $35 million in cash and 115,194 shares valued at $5 million. 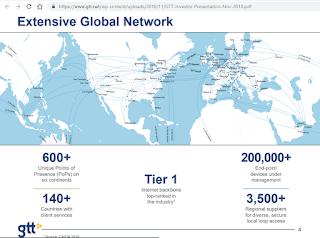 "With GTT, Access Point customers now have access to one of the industry’s largest Tier 1 global IP networks and a broad portfolio of cloud networking services backed by a commitment to providing outstanding service that mirrors our own,” said Richard Brown, Access Point CEO. “We value the loyalty of our customers, and we look forward to providing them an even more robust set of communication services as we integrate swiftly with GTT." A group of investors, led by Aleph Capital Partners LLP and Crestview Partners, has committed to invest $175 million in GTT common stock at the closing of the acquisition of Interoute by GTT. GTT Communications agreed to acquire Interoute, operator of one of Europe’s largest independent fiber networks and cloud networking platforms, for approximately €1.9 billion ($2.3 billion) in cash. Interoute's European fiber backbone spans 72,000 route kilometers connects nearly 200 data centres and colocation facilities. Interoute also owns 15 of its own data centers and 33 colocation facilities. Its customers include international enterprises, as well as the world’s major service providers, ICPs and OTT providers. The company also operates 18 Interoute Virtual Data Centres (VDCs) globally, including three in Asia-Pacific, which are tied into its fiber backbone. In October 2017, Interoute launched its "Edge SD-WAN" service. Interoute offers transport services (wavelength, Carrier Ethernet, managed bandwidth, storage connect, IP transit, cloud connect) and infrastructure services (dark fiber and data center colocation). Interoute reported revenues of €718 million and adjusted EBITDA of €165 million for the 12 months ending September 30, 2017. GTT said the merger contributes significant infrastructure, edge and hosted services to its network, as well as over 1,000 strategic enterprise and carrier clients, primarily headquartered in Europe. In January 2017, GTT acquired Hibernia Networks and its five subsea cables, including Hibernia Express, the lowest latency transatlantic cable system, and eight cable landing stations, new global points of presence, and key clients in the financial services, media and entertainment, web-centric and service provider segments. GTT Communications has acquired Accelerated Connections (ACI), a Toronto-headquartered provider of managed networking, voice-over-IP (VoIP) and colocation services, serving large distributed Canadian enterprises. Financial terms were not disclosed at this time. ACI operates a network connecting all of Canada's provinces, as well as two state-of-the-art data center facilities. GTT said the acquisition extends its market presence and unique network assets in Canada, including its landing station for GTT Express, the lowest latency transatlantic cable system. The acquisition also adds strategic clients in key vertical markets, including hospitality, retail and financial services. 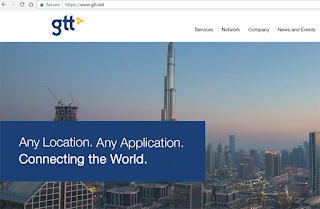 GTT has acquired Custom Connect, an Amsterdam-headquartered provider of high-speed network connectivity serving multinational enterprises and financial trading firms. Financial terms were not disclosed. Custom Connect, which was founded by Olav van Doorn and Jan Willem Meijer, operates a carrier-neutral MPLS/IP network that integrates SD-WAN and public and private clouds alongside existing data centers, offices, and branches. Its range of services includes low-latency connectivity to major financial exchanges, trading desks, and banks via SD-WAN integration with other carriers. In 2017, GTT acquired Global Capacity, a provider of enterprise network connectivity solutions, for $100 million in cash and 1.85 million shares of GTT common stock, to be issued to the sellers at closing. Global Capacity, which was based in Waltham, Mass., specialized in a range of enterprise network issues including difficulty in load sharing traffic across a mix of access connections, complex, static and manual network configurations that inhibit mapping to business requirements and lack of application visibility and control over connections. GTT Communications is now offering ultra-low latency transport services to key financial centers in Latin America, Asia and Africa. These include New York to Mexico City, Hong Kong to Tokyo, Hong Kong to Singapore, Mumbai to Singapore, and Johannesburg to London. The new routes run on GTT’s recently launched Ethernet Direct service platform, which is highly scalable and customizable to meet unique capacity, diversity and latency performance requirements. The company is offering a latency service level agreement on these routes. GTT is also launching a Time Synchronization service, offering clients a single source of time across their entire trading infrastructure. This can be used to correlate data sets and time-stamp trade executions within sub-microsecond Coordinated Universal Time accuracy. GTT Communications, a major global cloud networking provider serving multinational clients, announced an agreement with Jisc, the provider of digital solutions for the UK research and education community and operator of the Janet network for the delivery of Internet services. Under the agreement, GTT will provide high-speed Internet services for the Janet network to support the research and learning of its approximately 18 million UK college and university users. GTT delivers Internet services over its Tier 1 global IP backbone, which features over 300 points of presence and enable the provision of flexible, high-capacity cloud networking services to major organisations worldwide. GTT’s resilient Internet connectivity solution for Jisc is designed to guarantee high network availability, interconnecting via three geographically separated points of presence. The initial service agreement provides up to 120 Gbit/s of Internet capacity with the opportunity to further upgrade the service as Jisc's user demand increases. GTT noted that the Janet network is also the UK operator of Eduroam, the international roaming service for the education community with 70 million users. Janet operates a network that includes over 5,000 km of optical fibre and a backbone that runs at 100 Gbit/s with interconnect capacity of around 40 Gbit/s. GTT Communications agreed to acquire Global Capacity, a provider of enterprise network connectivity solutions, for $100 million in cash and 1.85 million shares of GTT common stock, to be issued to the sellers at closing. Global Capacity, which is based in Waltham, Mass., addresses a range of enterprise network issues including difficulty in load sharing traffic across a mix of access connections, complex, static and manual network configurations that inhibit mapping to business requirements and lack of application visibility and control over connections. Global Capacity has a partnership with VeloCloud. that unifies network management across disparate network technologies, including Ethernet, MPLS, broadband and LTE, whether these are on the Global Capacity network, a competing network or a combination of the two. This is designed to enable a more agile and responsive hybrid WAN solution and to offer a simplified path for migration from an existing network architecture. In January, Global Capacity launched the Ethernet Multi-Cloud Connect service, a virtual network service based on its One Marketplace software-defined network platform that allows enterprises to build multiple cloud services from a single port to access hybrid and multi-cloud solutions across multiple locations. The Ethernet Multi-Cloud Connect service employs an interconnection architecture with software orchestration to simplify multi-cloud connectivity and improve service performance. The solution enables businesses to connect to cloud locations or select from a list of interconnected One Marketplace Cloud destinations, including AWS, Google Cloud, Microsoft Azure and twenty cloud providers on the Equinix Cloud Exchange. GTT said the acquisition will add marquee clients in the healthcare, application service provider, retail and carrier markets, adding highly complementary recurring revenue streams. GTT also operates an SD-WAN service based on Velocloud. Global Capacity also operates an extensive on-net Ethernet over Copper infrastructure that reaches over 9.6 million U.S. commercial addresses, from 41 data centers and 1,750 Central Office points of presence. Global Capacity acquired Megapath's wholesale business and national colocation aggregation network in 2015. GTT Communications based in McLean, Virginia, a global cloud networking provider to multinational clients, announced the acquisition of Perseus, a provider of high-speed network connectivity that serves major financial and e-commerce companies worldwide. GTT stated that the purchase price for Perseus was $37.5 million, plus the assumption of approximately $3 million in capital leases. GTT anticipates that the purchase price will represent a multiple of post-synergy adjusted EBITDA of 5.0x or lower, with integration and cost synergies to be achieved within two quarters. 1. Extending the reach of its global, Tier 1 IP backbone via new PoPs and routes connecting key markets across Latin America, Asia Pacific, India and South Africa, including Pacific Express, the new low latency route between Chicago and Tokyo. 2. Increasing its customer base, bringing clients in the financial service and e-commerce segments. 3. Expanding its position as a provider of ultra-low latency services, as well as augmenting its cloud networking portfolio with financial market data services. Perseus operates a global multipoint Ethernet network and 75 PoPs sited in 18 countries and provides connectivity to over 200 exchanges. It maintains a network operations centre in Galway, Ireland. Perseus offers solutions including LiquidPath trading services, PrecisionSync timing services, private managed services and wireless, microwave-based connectivity. In January of this year, GTT completed its acquisition of Hibernia Networks, operator of a global network, including extensive subsea cable systems. Under the terms of an agreement announced in November 2016, GTT was to acquire Hibernia for $590 million, including $515 million in cash and approximately 3.3 million shares of GTT common stock valued at around $75 million. GTT Communications, a global cloud networking provider to multinational clients, which in January completed the acquisition of Hibernia Networks, announced it has established three new divisions - Enterprise, Carrier and EMEA - intended to accelerate sales growth and enhance services for customers. Each of the new divisions is responsible for the primary customer experience functions, including sales, quoting, ordering, service delivery and collections. 1. Eric Warren is to lead the Enterprise division, including all enterprise customers across the Americas and U.S. government clients; Mr. Warren recently joined GTT having previously held senior executive roles at companies including Windstream and tw telecom. 2. Jeff Beer will lead the Carrier division, including all carrier accounts in the Americas and GTT's largest web-centric clients; Mr. Beer has held a number of executive roles at GTT during the past eight years, having joined the company via its acquisition of Tinet. 3. Martin Ford is to head the EMEA division, encompassing enterprise clients in EMEA and carrier clients across EMEA and APAC; Mr. Ford joined GTT's leadership team through its acquisition of Hibernia Networks, and previously served with Level 3. 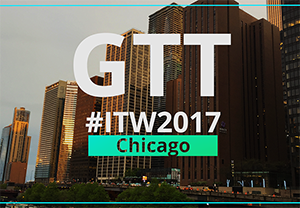 GTT has recently announced the launch of Optical Transport and Managed SD-WAN services. The Optical Transport offering is designed to provide customers with scalable bandwidth and low latency connectivity for the transport of data and cloud-based applications between financial markets, data centres, media hubs and service provider networks. The Managed SD-WAN service, using technology from VeloCloud, offers features including dynamic bandwidth management, optimised application performance and the ability to integrate network technologies into the corporate WAN. Hibernia Networks and GTT announced in early January this year the completion of the transaction under which GTT acquired Hibernia. The companies originally announced a transaction in early November 2016, through which GTT was to purchase Hibernia for $590 million, including $515 million in cash and approximately 3.3 million shares of GTT common stock valued at around $75 million. It's been a very big year for GTT. In January, GTT completed the aquisition of Hibernia Networks, which brings substantial assets, including a Layer 1 optical transport networrk and three subsea cable routes. GTT Express is now the fastest transatlantic cable. In this video, Rick Calder, GTT/s CEO, provides a company update. GTT Communications announced today the launch of its Managed SD-WAN service, powered by VeloCloud. The service offers dynamic bandwidth management, optimized application performance and the ability to integrate cost-effective network technologies into the corporate WAN. The service will also simplify network control, especially for branch locations, driving greater efficiencies in enterprise WAN management. GTT Communications, a global cloud networking provider that in January completed the acquisition of Hibernia Networks, announced the launch of Optical Transport services, designed to provide customers with scalable bandwidth and low latency connectivity for the transport of data and cloud-based applications between financial markets, data centres, media hubs and service provider networks. The new services leverage the company's extensive subsea and terrestrial optical network, which is optimised for latency performance. The network is based on a DWDM platform and includes three owned and operated, diverse trans-Atlantic cables, as well as over 75 points of presence across North America and Europe. GTT's optical transport service features wavelengths and low latency solutions, offered at 10 and 100 Gbit/s speeds. The company noted that the new low latency service provides high speed connectivity between major financial, media and commercial centres, delivered over GTT Express, the lowest latency trans-Atlantic cable that provides latency of less than 59 milliseconds between New York and London. The low latency service also provides card and route diversity. Hibernia Networks and GTT announced the completion of the transaction under which GTT acquired Hibernia on January 9th. The companies originally announced the transaction in early November 2016, through which GTT was to purchase Hibernia for $590 million, including $515 million in cash and approximately 3.3 million shares of GTT common stock valued at around $75 million. GTT Communications completed its previously announced acquisition of Hibernia Networks. The new Hibernia Express transatlantic cable is delivering an actual tested latency of better than 58.95ms (milliseconds) from New York to London, which is faster by more than half a millisecond off the original projected speed. Hibernia Networks said its new undersea cable has undergone rigorous testing over the past two weeks. Testing parameters included power stability, spectral efficiency and latency. The results confirmed the latency on Hibernia Express from LD4 in Slough, England to NY4 in Secaucus, New Jersey to be under 58.95ms. 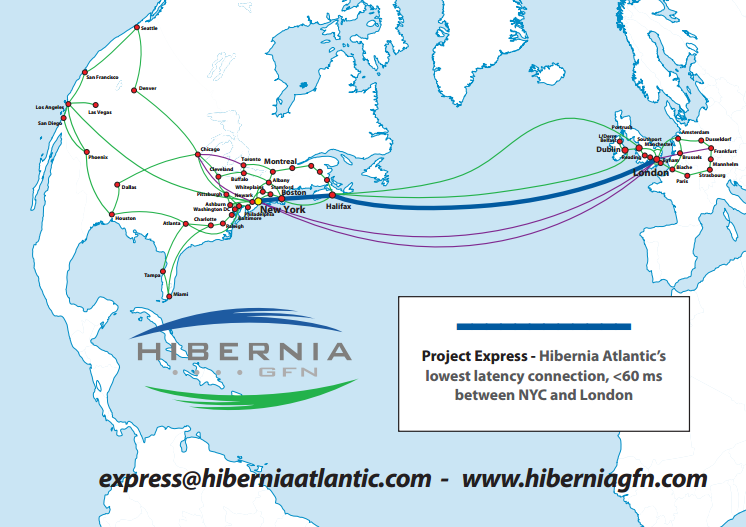 Hibernia Express utilizes a 6-fiber-pair submarine cable, with a portion of the fibers optimized for lowest latency and a portion optimized for 100X100 Gpbs design capacity. The total cross-sectional design capacity of the cable will be over 53 Tbps. Hibernia Express will initially launch with 100 Gbps transmission capacity using TE SubCom’s C100 SLTE platform. 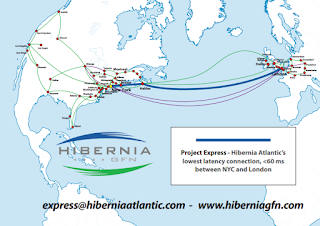 Hibernia Express follows the most direct route between the UK and North America, promising to reduce latency by at least 5 milliseconds over existing cables. GTT Communications agree to acquire Hibernia Networks, which owns the new Hibernia Express transatlantic cable systems and other terrestrial and undersea fiber assets, for $590 million. The deal consists of $515 million in cash and approximately 3.3 million shares of GTT common stock, to be issued to the sellers at closing, valued at $75 million. GTT operates a global Tier 1 IP network with owned and leased dark fiber assets including five owned subsea cables and eight cable landing stations. The company delivers global cloud services to multinational customers. GTT is based in McLean, Virginia. 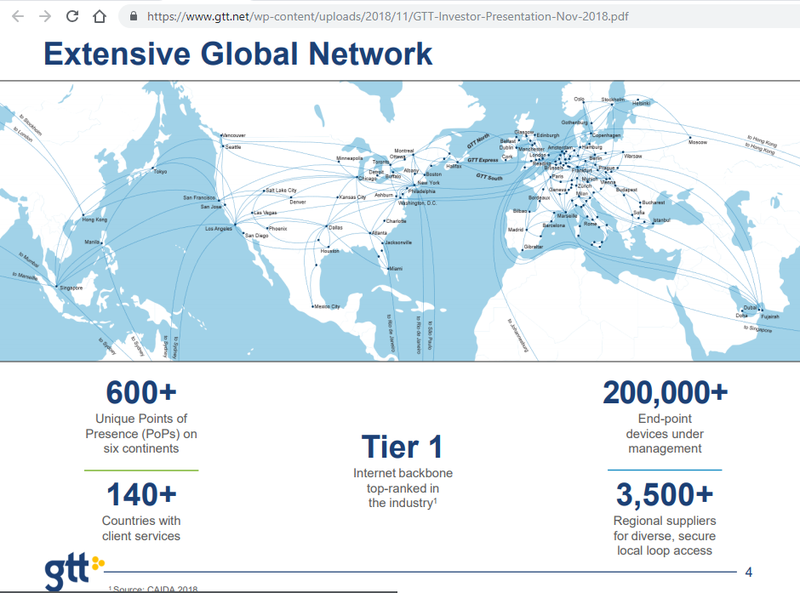 “GTT gains world class global fiber assets, including ultra-low latency routes between key financial markets, as well as optical, low latency and content services, and exceptional employees with a proven track record of network and commercial leadership, and exemplary customer service. Hibernia Networks clients around the world will benefit from the expansive reach of GTT’s Tier 1 IP network, the broader portfolio of products and services, improved scale, and the company’s expertise in delivering cloud networking solutions and managed services to multinational clients,” stated Bjarni Thorvardarson, Hibernia Networks’ chief executive officer. When it set out to build its new Hibernia Express transatlantic cable system, Hibernia Networks really was looking to achieve a couple of goals. The top goal was to provide absolutely the lowest latency across the Atlantic. Another ambition was to provide another diverse, high-capacity system that would be attractive to multiple customer segments. 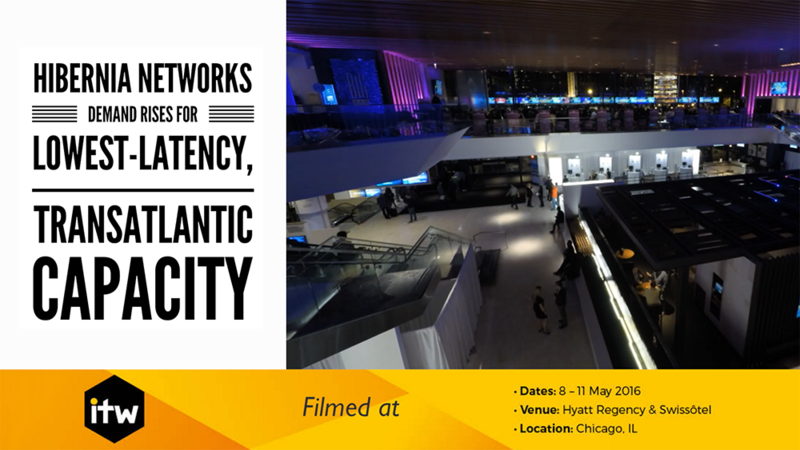 In this video, Al DiGabiele, SVP Product Management & Marketing at Hibernia Networks, talks about rising demand on the new cable system and a new protected-wavelength service with automated failure switching.